DENVER -- The attorney for the man shot at a Denver bar over the weekend by a dancing FBI agent says the injury to his client's leg is much worse than first reported. Attorney Frank Azar says the gunshot hit a main artery and his client could have bled to death. The owners of Mile High Spirits and Distillery say it was one of their quick-thinking security guards who took off his belt and applied a tourniquet to the victim’s leg. However, witnesses dispute the claim that it was a bar security guard who applied the tourniquet. A witness told Denver7's Lance Hernandez that he used his belt to apply the tourniquet, and he is not employed, nor is he affiliated with the bar in any capacity. The victim met with a vascular surgeon on Tuesday, according to Azar. 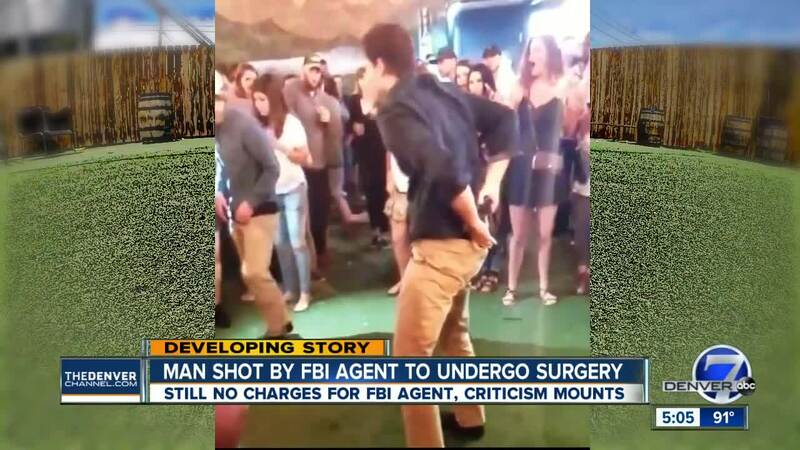 The viral video obtained by Denver7 shows the FBI agent dancing and doing a back flip, after which his gun falls out of his waistband, then accidentally fires when he went to pick it up. The shot hit the victim, who has still not been identified, in the leg and then hit a cinder block wall. There is now a chorus of growing outrage among the public as the agent waits to see if he will face charges in the case. The agent’s name is Chase Bishop, 29. He was visiting Denver, but works out of Washington D.C. Some experts say after reviewing the videos several times, the case rises to the level of felony assault. Denver police say they are waiting on laboratory tests to determine whether Bishop will face charges. “The main thing I'm concerned about is that he's being given incredibly special treatment because he's an FBI agent,” said attorney and legal expert David Lane. “Had that been ‘Joe Citizen’ in that bar doing exactly the same thing, the cops would have been there in a heartbeat. They would have slapped the cuffs on him and he would have been in jail on a fairly high bond. Because anybody acting that ridiculously stupid should be in jail on a high bond." Lane said this case rises to the level of second-degree felony assault because the agent caused serious bodily injury with a deadly weapon. "How many epic screw-ups in life start out with, ‘Hold my drink and watch this?’" Lane said. “And how many days does it take to review a videotape? You don't have to be Cecil B. Demille to dissect that film. Everybody can see it." Governor John Hickenlooper also addressed the incident on Tuesday from the state Capitol.